So I figured I too would join in on this fun fanfiction show and tell I love seeing new fics and seeing what else is out there that I may not have been able to find via Fanfic site so I think this is way cool! I kind of write a LOT of fanfics- probably more than I should I tend to get ideas and run with them until they are finished and I hope my stories reflect that. I like to write anything from super ultra fluff and romance to dark and deep characterizations- much of which come from my own life and experiences. Of my fanfics, there are a few I would love to share with you guys if you're at all interested! Prom Foolery is all about Prom and an accidental date. There is a lot of funny moments as well as some serious ArnoldxHelga fluff going on. and my other favorite which is actually the first of a Trilogy I wrote for this universe is called Please, Take Me With You which was inspired by a piece of the same name by Ragweed on deviantart. Funny moments in this as well, but focuses on what Helga and Arnold will be doing once they graduate high school and prepare for college. Lastly, my favorite oneshot I have ever written is entitled, Humans Without Wings and I'm not going to lie when I say if you had to choose ANY of my oneshots to read, this would be the one I would suggest. This is rated M for thematic situations as it revolves around a car crash between Arnold and Helga. Really a deep and powerful piece that I sincerely still think is my best work. Obviously, I kinda have loads of multi-chapter stuff plaguing my fanfic account haha. Arnold Management with Dr. Bliss was my first fanfic I ever wrote and is a really fluffy ArnoldxHelga tale of finally getting together once in high school- or at least attempting to. This story has a lot of homage's to the original series and a lot of 'easter eggs' throughout. SUMMARY: Dr. Bliss has been helping Helga with her 'issues' since fourth grade after socking Brainy. What happens when she leaves for a new job leaving Helga to figure the rest out on her own without Dr. Bliss' help? To the Fire Escape and Beyond was my first fic once coming back to the fandom and follows Arnold and Helga on a journey of trying to hide their relationship from their peers while juniors in High School. I took a lot of time to work on this story as it directly relates to "Romeo and Juliet," both the original story and the version done in the episode "School Play." This story is rated M for sexual content. (okay here it comes, you had to know I was gonna mention this fic) Spanish 2 Was All For You is my PRIDE AND JOY. This story is my baby- all epic 27 chapters of it!! It actually started out as a oneshot like 5 years ago and after some thought and time, i decided to embellish it and write it to be the TJM of my DREAMS. If you have any cravings for a darn good TJM fic... I'd hope you'd give mine a looksie. SUMMARY: Spanish 2 with Arnold was fun until a class presentation changes everything. When he leaves to chase his dreams & find his parents in the middle of the San Lorenzo jungle, it's Helga who is left behind with the secret she was never able to tell. But will a surprising video call from Arnold months later change her life forever? SUMMARY: Hillwood High is a muck with cliques like any other high school- Queen B's, Jocks, Preps, Nerds and even a bully or two to even out the score. In the end, will stereotypes prove stronger than the feelings between a tall-haired jock and the smartest girl in school? obviously, I have a bunch more fanfics not highlighted here on my fanfic account, which you can check out HERE if you are interested!! I hope you are! I'm so excited for your new one!!! Whoo hoo! Also, I really need to continue Arnold Management because that first chapter hooked me, I'm telling ya! Gaahfsdlfads; I'm telling you: the moment my brain stops being in its "productive" mood, I will read these right away! But I will definitely read "To the Fire Escape and Beyond" first, so I can whip out that pic for you! AibouFTW wrote: Gaahfsdlfads; I'm telling you: the moment my brain stops being in its "productive" mood, I will read these right away! You're doing a picture for her? Have you done one before for her? Yes I am, but I haven't started it yet. She had asked me a long time ago (I think it was either the end of November or the beginning of December), but I had so much on my plate, I asked her to wait until April. No, I've never done one for her before (or any other commissions either), so I'm excited! AibouFTW wrote: Yes I am, but I haven't started it yet. She had asked me a long time ago (I think it was either the end of November or the beginning of December), but I had so much on my plate, I asked her to wait until April. No, I've never done one for her before (or any other commissions either), so I'm excited! So I know I don't post a whole lot on here (I read more than I comment cause I'm kind of bad at talking to people with my shyness and all) but I've been working on a new multi-chapter fanfic that really means a lot to me, so if you're in the mood, I'd love for you guys to read it. It's called, "The Club" and you might have seen it mentioned somewhere before (like aibouftw's AMAZING commission she did for me) but I wanted to give a shoutout for it here in case anyone is interested. 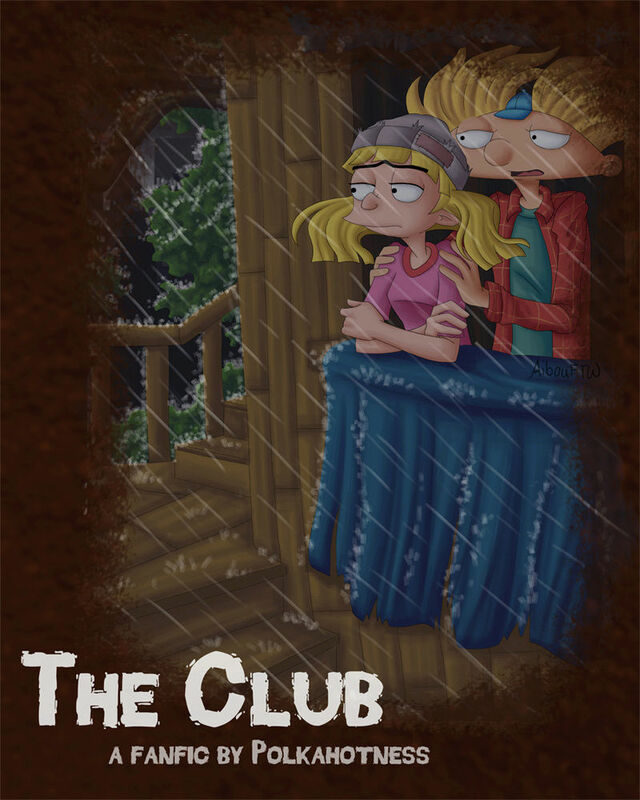 Basically, "The Club" is about Olga dying and how Helga and her family deal with the loss; also how Helga and Arnold deal with their almost-relationship prior to her passing away. The story is deep and rated M for the content mostly related to death and the grief process/mild swearing. All in all, I believe this to be one of the best fics I have ever written and I would be so ecstatic if you guys would check it out and let me know what you think. If you're looking for a tear-jerking, emotionally wild and character-driven ride, "The Club" is for you!! SUMMARY:I never thought life without Olga would cause so many problems for me. After all, out of everybody I knew, I was probably the only one with just cause enough to want her gone. But now that she was, everything was up in the air, including my relationship with Arnold. Could a view from Mighty Pete shed light on what I'd lost? Or only help me lose Arnold forever? Sorry that i'm late to this thread but thanks for sharing these fanfics!! I'm really loving "The Club" so far!